What a backwater place we might have become if those thrifty, ambitious, adaptable, brilliant and sly Scots hadn’t emigrated here. 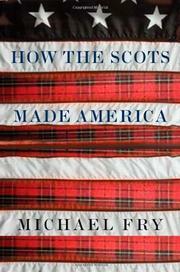 In an entertaining mix of hyperbole and good old-fashioned chauvinism, Fry (economics correspondent for The Scotsman) looks at the histories of Scotland and the US and discovers both connections and conundrums. He begins with the obvious (Scotland is small and old, the US big and new), then moves into a series of chapters that outline the contributions to our history made by individual Scots and by Scottish traditions and philosophies. We learn that Jefferson had some Scottish blood—and that both Hamilton and Burr studied with a Scot (are we reaching too far yet?). The author notes the influences of David Hume and Adam Smith; charts the bloodlines of American presidents (LBJ and Nixon both had some genes from the old country); and reminds us that Davy Crockett, Sam Houston, Kit Carson, and Jim Bowie had Scots in their family trees. (He doesn’t remind us that Bowie was in the slave trade with Jean Lafitte and was a shameless forger of Spanish land grants.) American writers with Scottish blood include Washington Irving, Cooper, and Hawthorne—oh, and Poe’s foster father, David Allan, was a Scot. Fry notes the strong influence on Scots on the history of Princeton University. There’s a chapter on the Scots in Canada; lists of Scots (and partial Scots) who invented things (James Watt); Scots who helped fashion our economy and industry (John Law, Andrew Carnegie, Bill Gates); who dominate our media (Rupert Murdoch); who entertain us (Sean Connery, John Wayne, Marilyn Monroe); and who flew into space (John Glenn, Alan Shepard). Even kilt-crazy Trent Lott joins the parade. Fry believes that Americans are occasionally daffy: we rally around “clownish” politicians and embrace multiculturalism, which, argues the author in several places, is both shallow and ludicrous.